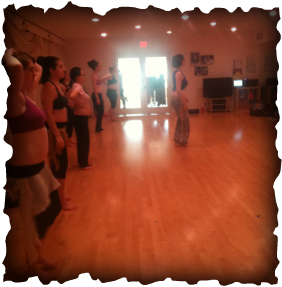 Alyssum teaches tribal style bellydance, and tends to focus on muscle technique, transitions, expression, and improvisation. She loves working with students, helping them to understand their bodies, and enjoy the dance. She is available for private lessons, semi-private lessons, and workshops (please contact for descriptions). Please contact her for rates, or if you're interested in setting up regular classes at your local health/fitness club. More Info can be found under the "Events" tab above. Please inquire at Sahara for more info. Alyssum is always available for private lessons. "I think the most amazing part of it for me was how nervous and scared I was to step out of my comfort zone (even though I am well versed in improv bellydance), but that once we completed the exercises, I felt completely invigorated and joyful. I am glad that I asked you to choose your pick of the workshops you offered, because I don't think I would have picked "Improve Your Improv," given my reservations. I think the concepts you are teaching are highly unique and very useful for any type of dancer." --Rachael Gollub, Director of Ophira Tribal. "You are a great teacher, able to explain just what we need to hear and encouraging ... So your patience is very much appreciated. You also have good skill at knowing how long to stay on certain exercises or moves and how to move the class along fast enough without overwhelming us. During her stay in Guatemala during the Summer of 2010, Alyssum volunteered at the Luis Cardoza y Aragon Popular Culture Center, teaching English to local children through dance. These classes were offered for free to local (Quetzaltenango) children from families of limited economic resources. Grooving to Michael Jackson, learning the names of body parts in English, becoming more comfortable in their own skin, more able to control isolated body parts, and showing off their own dance skills were all things that these children seemed to relish. OmBellyCo is the Boston-based troupe that Alyssum coached 2004-2008. She could not have asked for a kinder, more dedicated group of ladies to have worked with, and is proud of their accomplishments.